Objective: To investigate the role of cardiovascular magnetic resonance (CMR) in a series of patients with ECG repolarisation changes and normal echocardiography. Patients and design: 10 patients with anterolateral T wave inversion for which there was no obvious pathological cause who had normal routine echocardiography without contrast for the exclusion of hypertrophic cardiomyopathy (HCM) also had CMR that was diagnostic of apical HCM. Results: Apical HCM detected by CMR could be morphologically severe with wall thickness up to 28 mm, or mild. The extent of repolarisation abnormalities did not correlate to the morphological severity. Conclusions: In patients with unexplained repolarisation abnormalities, a normal routine echocardiogram without contrast does not exclude apical HCM. Further imaging with CMR or contrast echocardiography may be required. The reliance on routine echocardiography to exclude apical HCM may have led to underreporting of this condition. When patients present with unexplained ECG repolarisation abnormalities and the history, examination, and echocardiography are not illuminating, the diagnosis poses a significant challenge. There is a wide differential diagnosis including various cardiomyopathies. The patients may undergo lengthy investigation, which may ultimately be fruitless, with implications for lifestyle and life insurance. One cause of an abnormal ECG is apical hypertrophic cardiomyopathy (HCM). The ECG in apical HCM typically shows repolarisation changes in the anterolateral leads and sometimes giant negative T waves. Apical HCM appears to be less benign in western countries than in Japan, with atrial fibrillation and myocardial infarction the most frequent complication occurring in up to a third of patients during long term follow up, rather than sudden death.1,2 Management includes diagnosis, risk stratification, and family screening. The diagnosis of apical HCM depends on the detection of localised apical hypertrophy by imaging3 and non-contrast echocardiography has been the usual first line investigation. However, echocardiography has limitations for visualising the apex and apical hypertrophy4,5 and may miss apical HCM.6,7 These limitations are not encountered with cardiovascular magnetic resonance (CMR). There have been reports of isolated cases where CMR has detected apical HCM unrecognised by echocardiography.8 We report a series of 10 patients who had non-diagnostic echocardiography reports in whom CMR detected unrecognised apical HCM. The 10 patients (eight men, mean (SD) age 56 (5) years) all had repolarisation changes in their anterolateral leads in the form of T wave inversion, three with giant negative T waves. In all cases a pathological cause for the electrocardiographic changes had not been determined but HCM was suspected. Five patients had been found to have an abnormal ECG on routine medical examination. Four had unexplained symptoms, of whom one had a family history of an abnormal ECG and one was found because of a family history of coronary artery disease. None of the patients had a history of hypertension but one was an amateur long distance runner. No patient had a family history of HCM. Table 1 presents patient details and results. All patients had undergone an echocardiography investigation at either Royal Brompton Hospital or St George’s Hospital, London. In all cases the presence of apical HCM was not confirmed. The echocardiography machines used were the Hewlett-Packard Sonos 5500 system with S4 probe or GE system fiVe. Both machines have harmonics available. Views were reported as poor for one patient and appeared poor on review for one other patient. No patient at this stage underwent contrast echocardiography. CMR was performed without the use of an exogenous contrast agent on a 1.5 T Siemens Sonata scanner (Erlangen, Germany) with front and back surface coils and prospective electrocardiographic triggering. Imaging consisted of scouts and subsequent two and four chamber fast imaging with steady state precession cines. If necessary, the long axis views were repiloted to ensure that the slice passed precisely through the distal apex and fully appreciated the cavity, even when the cavity was almost obliterated (fig 1). This ensured true perpendicular measurement of apical wall thickness and cavity. Breath hold short axis slices from the atrioventricular ring to the apex were acquired with a slice thickness of 7 mm and a 3 mm gap, with one slice per breath hold, according to our standard in-house clinical protocol.9 Image parameters were a repetition time of 3.2 ms, echo time 1.6 ms, in-plane pixel size 2.3 × 1.4 mm, slice thickness 7 mm, and flip angle 60°, acquired in about 12 heart beats. 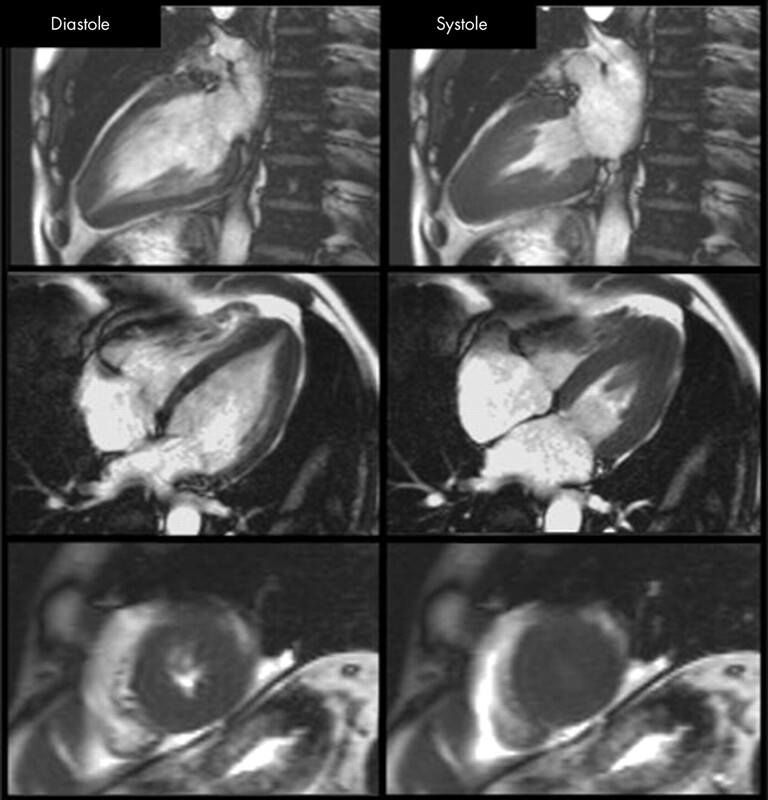 (A) Left ventricular outflow tract and (B) four chamber cardiovascular magnetic resonance (CMR) views of a patient with apical hypertrophic cardiomyopathy (HCM). Accurate slice alignment shows the true apical cavity (arrows). The diagnosis of apical HCM with spade like configuration was based on published criteria of both an apical wall thickness > 15 mm and a ratio ⩾ 1.3 of maximum left ventricular short axis thickness at the apical level to the basal level.10 Measurements were taken from end diastolic short axis views. Four chamber and two chamber images were also assessed for the presence of apical cavity obliteration and a spade like systolic cavity configuration (fig 2). A typical patient with apical HCM. There is apical regional hypertrophy, which in systole produces a classic spade shaped ventricular cavity. In the short axis views, the apical cavity is obliterated during systole. Apical HCM was found in all 10 patients with the use of CMR. Apical hypertrophy (table 1, fig 3) ranged from mild to severe (maximum wall thickness 28 mm). No relation was seen between the degree of hypertrophy and echocardiographic findings or the depth of T wave inversion on the ECG (fig 4). Examples of (A) mild, (B) moderate, and (C) severe apical HCM. All three patients exhibit the typical asymmetrical apical hypertrophy but this is more subtle in (A) and requires an accurate slice to show the apical morphology. 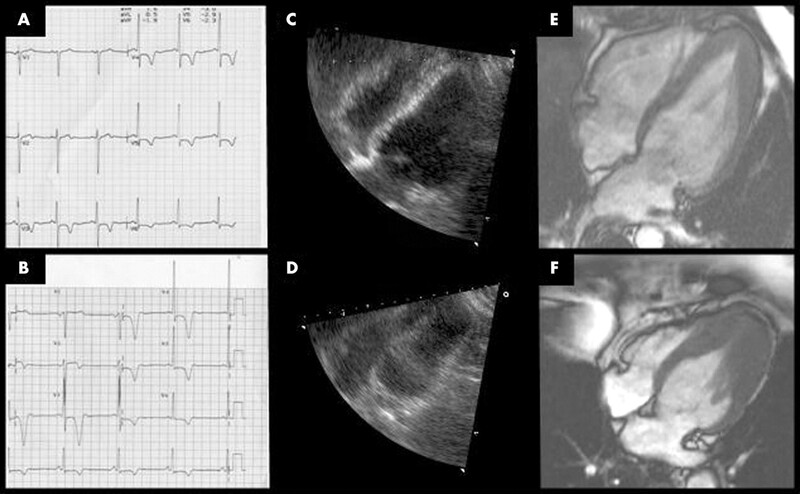 ECGs (panels A, B), four chamber echocardiograms (panels C, D), and CMR views (panels E, F) from two patients with apical HCM. Both patients have T wave inversion, with giant negative T waves (B). The echocardiographic images do not identify the apical endocardial border, which is clear by CMR. We describe 10 patients with an abnormal ECG and non-diagnostic echocardiography where CMR detected apical HCM. The implications are that conventional clinical assessment algorithms are missing patients with apical hypertrophy and that routine echocardiography cannot exclude apical HCM when assessing the patient with an abnormal ECG. Experience with CMR in apical hypertrophy and apical HCM is growing. For apical morphology in HCM, Japanese studies have used CMR.28 CMR has been compared with echocardiography for the detection of hypertrophied segments and was found to be superior to echocardiography in detecting apical segment hypertrophy.7 In a recent large series of apical HCM, nine of 105 patients were initially reported to have negative echocardiograms, which on review after CMR were positive.2 This experience is complemented by several case reports of apical HCM missed with echocardiography or of apical underevaluation.8,29 To our knowledge, our series is unique in describing a significant experience of apical HCM missed by echocardiography. In this series, all the patients had ECG abnormalities in the form of T wave inversion but only half the patients had giant negative T waves. Patients with subtle repolarisation changes may have severe morphological apical HCM, highlighting the importance of additional imaging of such patients where echocardiography is normal. Other causes of extensive T wave inversion may need to be excluded, such as coronary disease, particularly of the proximal left anterior descending artery. T wave inversion can be present in other conditions such as Brugada syndrome, arrhythmogenic right ventricular cardiomyopathy, subarachnoid haemorrhage, and metabolic abnormalities including hypocalcaemia. More localised T wave inversion may be present in other conditions such as left ventricular hypertrophy. The consequences of missed apical HCM for a patient include unnecessary investigation and missed treatment. On a population scale, however, missed apical HCM implies that the prevalence of apical HCM may have been underreported. If this is the case, then previous echocardiography based studies describing the natural history and risk of apical HCM in the west may be biased, underestimating the prevalence but possibly overestimating the risks associated with the diagnosis. In patients with ECG repolarisation abnormalities without an explained cause, routine echocardiography without contrast may not exclude apical HCM. Definitive exclusion of this important diagnosis requires further imaging such as CMR or contrast echocardiography. Dr McKenna (chair holder) and Dr James Moon (Junior Research Fellowship) are supported by the British Heart Foundation. The Centre for Advanced Magnetic Resonance in Cardiology (CAMRIC) was supported by a cardiovascular initiative grant from the British Heart Foundation. Support was also received from CORDA The Heart Charity. The authors thank Dr D G Gibson for advice on the preparation of the manuscript. Abinader EG, Sharif D, Shefer A, et al. Novel insights into the natural history of apical hypertrophic cardiomyopathy during long-term follow-up. Isr Med Assoc J2002;4:166–9. Eriksson MJ, Sonnenberg B, Rakowski P, et al. Long-term outcome in patients with apical hypertrophic cardiomyopathy. J Am Coll Cardiol2002;39:638–45. Sakamoto T. Apical hypertrophic cardiomyopathy (apical hypertrophy): an overview. J Cardiol2001;37(suppl 1):161–78. Suzuki Y, Kadota K, Nohara R, et al. Recognition of regional hypertrophy in hypertrophic cardiomyopathy using thallium-201 emission-computed tomography: comparison with two-dimensional echocardiography [abstract]. Am J Cardiol1984;53:1095. Vacek JL, Davis WR, Bellinger RL, et al. Apical hypertrophic cardiomyopathy in American patients [abstract]. Am Heart J1984;108:1501. Casolo GC, Trotta F, Rostagno C, et al. Detection of apical hypertrophic cardiomyopathy by magnetic resonance imaging. Am Heart J1989;117:468–72. Pons-Llado G, Carreras F, Borras X, et al. Comparison of morphologic assessment of hypertrophic cardiomyopathy by magnetic resonance versus echocardiographic imaging. Am J Cardiol1997;79:1651–6. Ibrahim T, Schwaiger M. Diagnosis of apical hypertrophic cardiomyopathy using magnetic resonance imaging. Heart2000;83:E1. Pennell DJ. Ventricular volume and mass by CMR. J Cardiovasc Magn Reson2002;4:507–13. Suzuki J, Shimamoto R, Nishikawa J, et al. Morphological onset and early diagnosis in apical hypertrophic cardiomyopathy: a long term analysis with nuclear magnetic resonance imaging. J Am Coll Cardiol1999;33:146–51. Keren G, Belhassen B, Sherez J, et al. Apical hypertrophic cardiomyopathy: evaluation by noninvasive and invasive techniques in 23 patients. Circulation1985;71:45–56. Sakamoto T, Tei C, Murayama M, et al. Giant T wave inversion as a manifestation of asymmetrical apical hypertrophy (AAH) of the left ventricle: echocardiographic and ultrasono-cardiotomographic study. Jpn Heart J1976;17:611–29. Yamaguchi H, Nishiyama S, Nakanishi S, et al. Electrocardiographic, echocardiographic and ventriculographic characterization of hypertrophic non-obstructive cardiomyopathy. Eur Heart J1983;4(suppl F):105–19. Prasad K, Atherton J, Smith GC, et al. Echocardiographic pitfalls in the diagnosis of hypertrophic cardiomyopathy. Heart1999;82(suppl 3):III8–15. Maron BJ, Spirito P, Green KJ, et al. Noninvasive assessment of left ventricular diastolic function by pulsed Doppler echocardiography in patients with hypertrophic cardiomyopathy. J Am Coll Cardiol1987;10:733–42. Nihoyannopoulos P, Karatasakis G, Frenneaux M, et al. Diastolic function in hypertrophic cardiomyopathy: relation to exercise capacity. J Am Coll Cardiol1992;19:536–40. Takenaka K, Dabestani A, Gardin JM, et al. Left ventricular filling in hypertrophic cardiomyopathy: a pulsed Doppler echocardiographic study. J Am Soc Echocardiogr1986;7:1263–71. Soman P, Swinburn J, Callister M, et al. Apical hypertrophic cardiomyopathy: bedside diagnosis by intravenous contrast echocardiography. J Am Coll Cardiol2001;14:311–3. Florenciano R, Castillo JA, Molina E, et al. Diagnosis of apical hypertrophic cardiomyopathy using contrast echocardiography. Rev Esp Cardiol2001;54:1336–8. Ward RP, Weinert L, Spencer KT, et al. Quantitative diagnosis of apical cardiomyopathy using contrast echocardiography. J Am Soc Echocardiogr2002;15:316–22. Soler R, Rodriguez E, Rodriguez JA, et al. Magnetic resonance imaging of apical hypertrophic cardiomyopathy. J Thorac Imaging1997;12:221–5. Suzuki J, Watanabe F, Takenaka K, et al. New subtype of apical hypertrophic cardiomyopathy identified with nuclear magnetic resonance imaging as an underlying cause of markedly inverted T waves. J Am Coll Cardiol1993;22:1175–81. Webb JG, Sasson Z, Rakowski H, et al. Apical hypertrophic cardiomyopathy: clinical follow-up and diagnostic correlates. J Am Coll Cardiol1990;15:83–90. Oppelt A, Graumann R, Barfuss H. Fisp: a new fast MRI sequence. Electromedica1986;54:15–8. Thiele H, Nagel E, Paetsch I, et al. Functional cardiac MR imaging with steady-state free precession (SSFP) significantly improves endocardial border delineation without contrast agents. J Magn Reson Imaging2001;14:362–7. Scheffler K. A pictorial description of steady states in rapid magnetic resonance imaging. Concepts Magn Reson1999;11:291–304. Suzuki J, Sakamoto T, Takenaka K, et al. Distribution patterns of hypertrophy at the apical level in patients with giant negative T waves: identification by magnetic resonance imaging. J Cardiol1988;18:673–82. Gaudio C, Pelliccia F, Tanzilli G, et al. 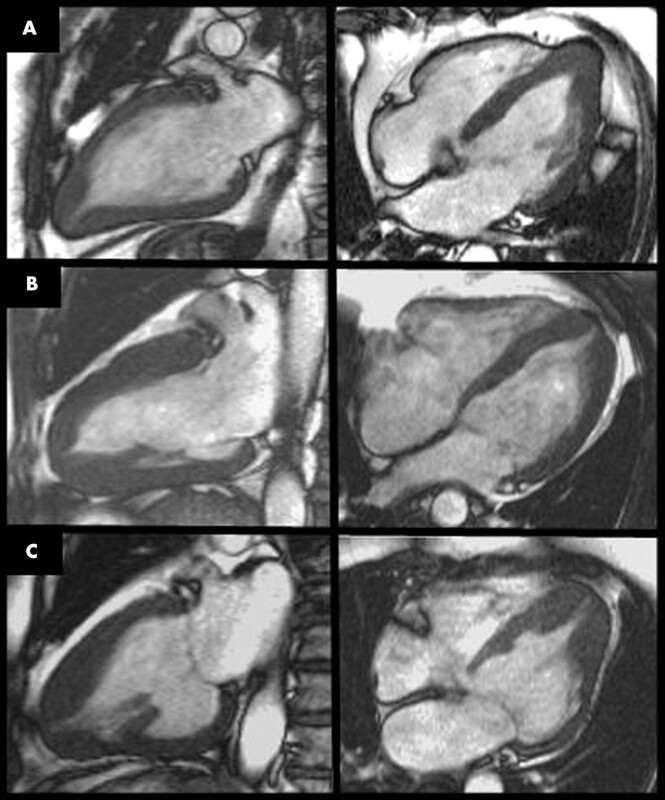 Magnetic resonance imaging for assessment of apical hypertrophy in hypertrophic cardiomyopathy. Clin Cardiol1992;15:164–8.